Getting a pay raise while sitting on the couch? Sign me up! Thanks Ventas for a solid increase! Fridays are always great days since it means the weekend is ahead although I have to say they're a little bit sweeter whenever there's a dividend increase announced as well. That's exactly what the Board of Directors at Ventas, Inc. (VTR) did raising the dividend payment from $0.73 to $0.775. That's a solid 6.2% increase. Ventas is a Dividend Challenger with 2016 marking 7 consecutive years of dividend growth. Shares currently yield 4.96%. Since I own 23.374 shares of Ventas in my FI Portfolio this raise increased my forward 12-month dividends by $4.21. This is the 1st dividend increase I've received from Ventas since initiating a position in early 2015 although the lack of increases is due to the Care Capital Properties spinoff which is understandable. So my total organic dividend growth from Ventas comes to 6.2%. According to USInflationCalculator the total rate of inflation over the same period is just 2.0%. Despite just one raise from Ventas in nearly 2 years of owning the company they are still outpacing inflation by 3x. Ventas' dividend history looks quite odd on the surface so some explaining is needed. The dividends in 1999 and 2000 were annual dividends and since then quarterly payments have been made so that explains the apparent decline from 2000 to 2001. The 2 large drops in mid 2011 and early 2015 were actually due to Ventas splitting their dividend payments for those quarters into 2 payments due to the various acquisitions/spinoffs they've done. Ventas has paid the same or higher dividend every year since 2009. Although Ventas did keep their dividend steady from 2009 compared to 2008 so their streak was reset to then. 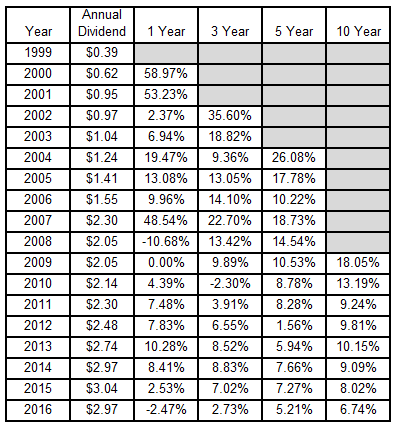 One more thing you'll notice by looking at the dividend growth rates is the apparent 10% decrease for 2007 to 2008. That was due to Ventas changing from one of the quarterly payouts being in January to December so 2007 actually had 5 dividend payments which explains the decline. It also looks like Ventas has a decline from 2016 compared to 2015, although these growth rates exclude the Care Capital Properties dividends which show an increase for Ventas' payouts. Despite the murky dividend growth history Ventas has a solid track record of raises. My forward dividends increased by $4.21 with me doing nothing. That's right, absolutely nothing to contribute to their operations. Based on my portfolio's current yield of 2.91% this raise is like I invested an extra $145 in capital. Except that I didn't! One of the companies I own just decided to send more cash my way. 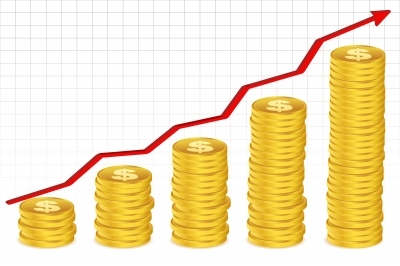 For a dividend growth investor there's not much better than hearing news of a dividend increase. So far this year I've received 49 increases from 40 companies increasing my forward 12-month dividends by $279.93. My FI Portfolio's forward-12 month dividends increased to $5,571.77 and including my Loyal3 portfolio's forward dividends of $66.36 brings my total taxable account forward dividends to $5,638.13. My Roth IRA's forward 12-month dividends remain at $241.75. Do you own shares of Ventas, Inc.?